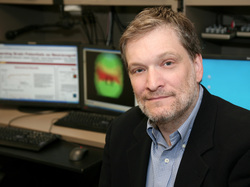 Robert G. Morrison, PhD, Associate Professor of Psychology and Neuroscience at Loyola University Chicago, uses behavioral, computational, and neuroimaging methods to investigate memory and reasoning throughout the lifespan. Dr. Morrison received his BS in Chemistry from Wheaton College prior to studying visual art at the Cleveland Institute of Art. While working as an artist Morrison became fascinated with the cognitive science of creativity. He pursued this interest studying visual mental imaging at Cleveland State University prior to receiving his PhD in Cognitive Neuroscience from the University of California, Los Angeles in 2004. After co-founding Xunesis (xunesis.org) and completing a National Institute of Aging funded post-doctoral fellowship at Northwestern University, Morrison joined the Department of Psychology and the Neuroscience Institute at Loyola in 2009. Robert G. Morrison has published numerous scientific articles and chapters and has edited the Cambridge Handbook of Thinking and Reasoning (Cambridge University Press, 2005) and the Oxford Handbook of Thinking and Reasoning (Oxford University Press, 2012). Dr. Morrison’s research has been funded by the Office of Naval Research, the National Institute of Aging, the American Federation of Aging Research, and the Illinois Department of Public Health. As a professor at Loyola University Chicago, Dr. Morrison enjoys his time in the classroom and lab where he has taught and mentored many talented students. He received the Edwin T. and Vivijeanne F. Sujack Award for Teaching Excellence in 2013 and the Langerbeck Award for Undergraduate Research Mentoring in 2012. In a parallel career as an artist he has exhibited his painting, sculpture and photography in galleries and museums throughout the United States. Please see here to download publications by Robert G. Morrison.